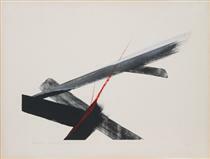 Toko Shinoda (篠田 桃紅, Shinoda Tōkō, born March 28, 1913) is a Japanese artist working with sumi ink paintings and prints. 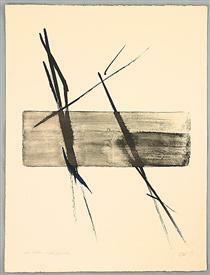 Her art merges traditional calligraphy with modern abstract expressionism. A 1983 interview in Time magazine asserted "her trail-blazing accomplishments are analogous to Picasso's". 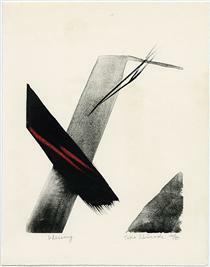 Shinoda's works had been exhibited in the Hague National Museum, the Art Institute of Chicago, Cincinnati Art Museum and other leading museums in the world. Shinoda was born into a wealthy family in Dalian, Manchuria, where her father managed a tobacco factory. Two years later, her family returned to Japan. 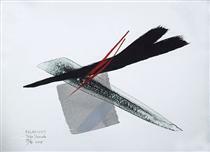 Influenced by her father's love of sumi ink painting, calligraphy and Chinese poetry, Shinoda practiced calligraphy from the age of six. 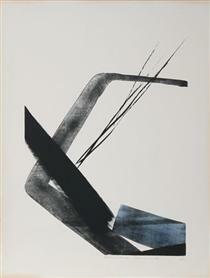 In 1940, Shinoda had her first solo exhibition at Kyukyodo Gallery. 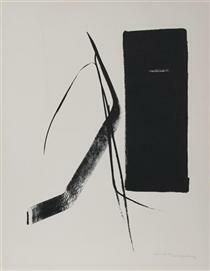 She began working on abstract paintings in sumi by 1945. 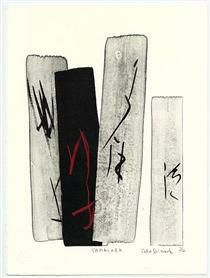 Shinoda traveled the United States from 1956 to 1958. She came into contact with the works of Jackson Pollock, which left a deep impression on her. 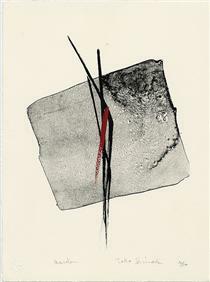 She moved beyond traditional calligraphy towards an expressive, abstract style. During her time in the United States, she had a number of exhibitions, which helped to make her name. 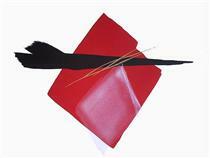 Her works were bought by a number of high-profile collectors. 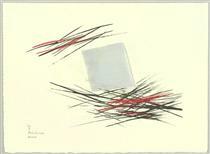 Shinoda also became involved in the abstract expressionist movement of the time. She returned to Japan and continues to work. She turned 100 in March 2013. She has remained unmarried and considers herself as married to her work. 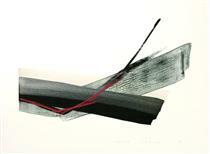 The artist prefers her paintings and original drawings, because sumi ink presents unlimited color spectrum. 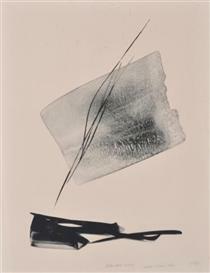 Her paintings are primarily monochromatic, using sumi black, with some use of cinnabar, gold, silver, or platinum. 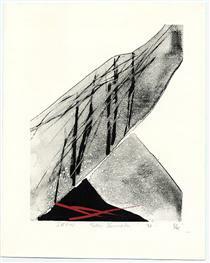 In printmaking, Shinoda uses lithograph as her medium. 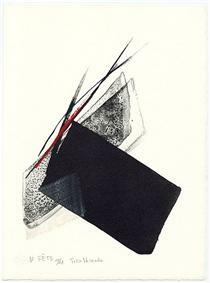 Unlike woodcut that requires chisel, or etching that requires acid, lithograph allows Shinoda to work directly and spontaneously on the plate with her fluid brushstroke. 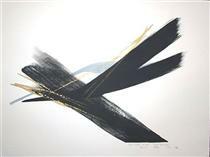 Shinoda’s strokes are meant to suggest images and vitality of nature. She says, “Certain forms float up in my mind’s eye. Aromas, a blowing breeze, a rain-drenched gust of wind…the air in motion, my heart in motion. 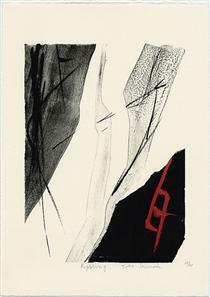 I try to capture these vague, evanescent images of the instant and put them into vivid form.” Shinoda's print editions are small, usually ranging from twelve to fifty-five, and after each edition has been pulled, she often adds a stroke or two of sumi color by hand to each print. 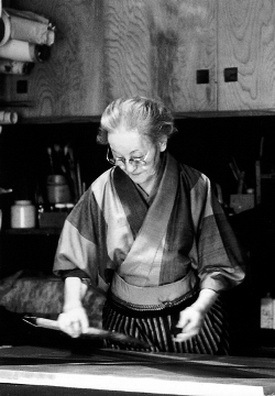 She also created sliding doors with abstract blocks called Hi-fu-mi-yo in 1991 for the Zōjō-ji in Tokyo. 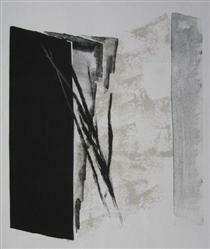 Her piece Evolution in 1996 which is a three-dimensional work created out of wood, painted in sumi ink. 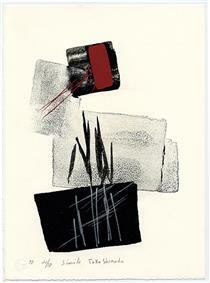 Shinoda's works are collected by numerous private collectors and public galleries and museums, notably Museum of Modern Art in New York, NY, Solomon R. Guggenheim Museum in New York, NY, Metropolitan Museum in New York, NY, National Museum of Modern Art in Tokyo, Japan, British Museum in London, UK, Art Institute of Chicago in Chicago, IL, Smithsonian Arthur M. Sackler Gallery in Washington, D.C., Singapore Art Museum in Singapore, National Museum of Singapore in Singapore, Kröller-Müller Museum in Otterlo, Netherlands, Brooklyn Museum in New York, NY, Albright–Knox Art Gallery in Buffalo, NY, Cincinnati Art Museum in Cincinnati, OH, and Yale University Art Gallery in New Haven, CT. Arrived Wind Toko Shinoda ?